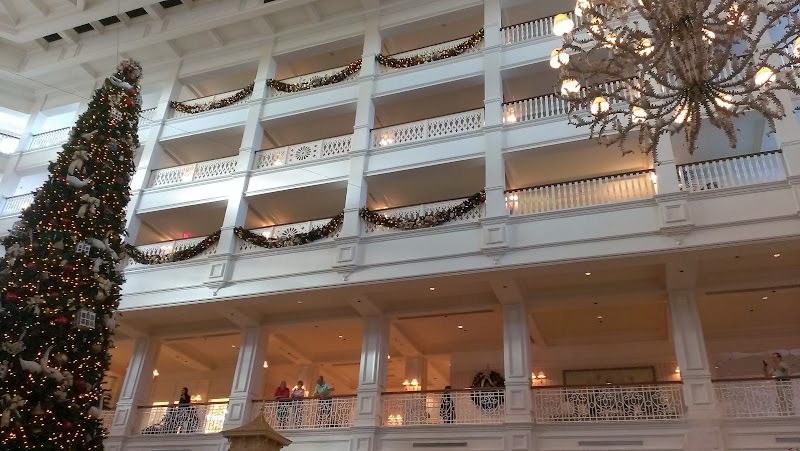 Home→Fun Stuff→Attractions & Tours→Florida→Deck the Disney Halls! 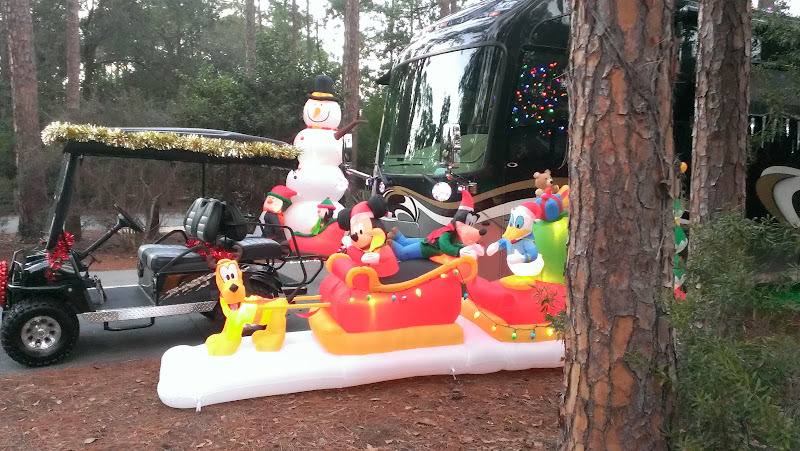 Deck not only the halls but your motor home, 5th wheeler, trailer, tent, golf cart, lamp post, hotel or whatever….one thing for sure is that there is no lack of Christmas spirit here at Disney! Not quite used to the combination of palm trees, Christmas trees and 80 degree temps all at the same time yet but it sure beats bundling up in cold, frosty temps and shoveling snow! 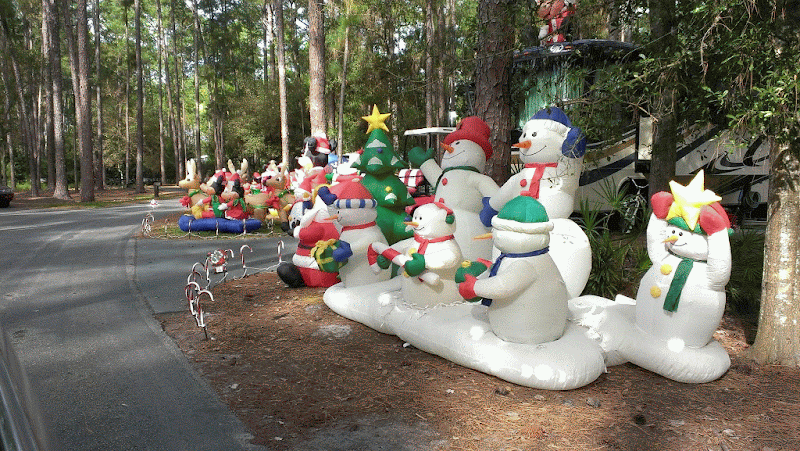 Based on what we’re seeing at Ft. Wilderness, the economy hasn’t impacted the decorative inflatable business – it is booming! 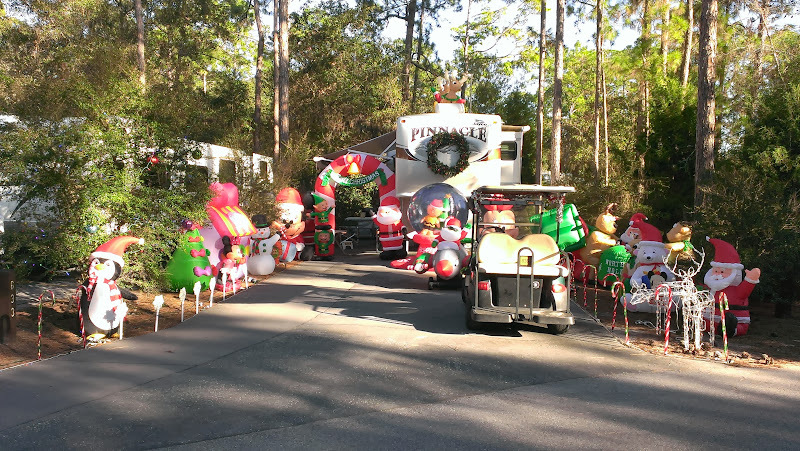 Gigantic inflatable snowmen, Santa, reindeer, airplanes, Mickeys, M & M’s, palm trees, flamingos and even dachshunds are everywhere. 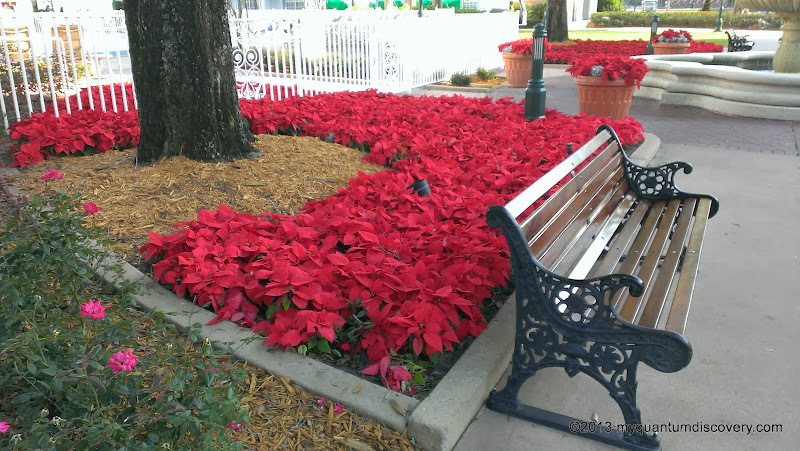 On Friday morning as we were heading over to Magic Kingdom, we noticed our neighbors on the passenger side had left. When we got back around 2 pm, a 5th wheeler had pulled in and boy, were they busy! 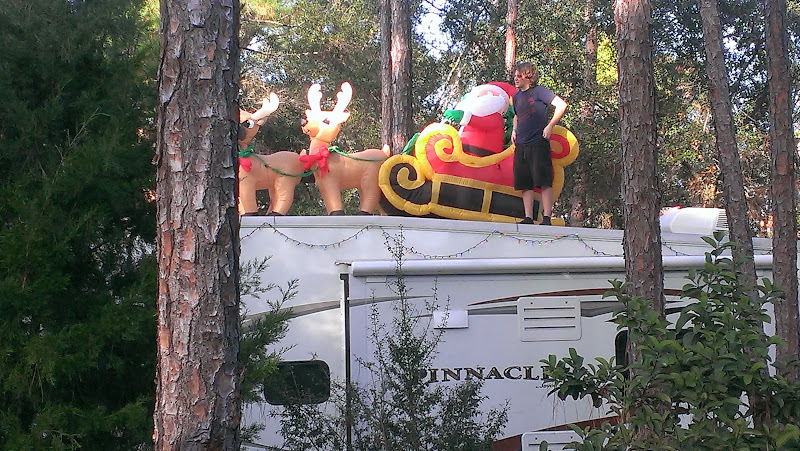 Up on the rooftop an elf (aka teenage boy) was busy installing Santa in his sled and eight not so tiny reindeer! Well, actually there were only 3 rather large reindeer, not 8. 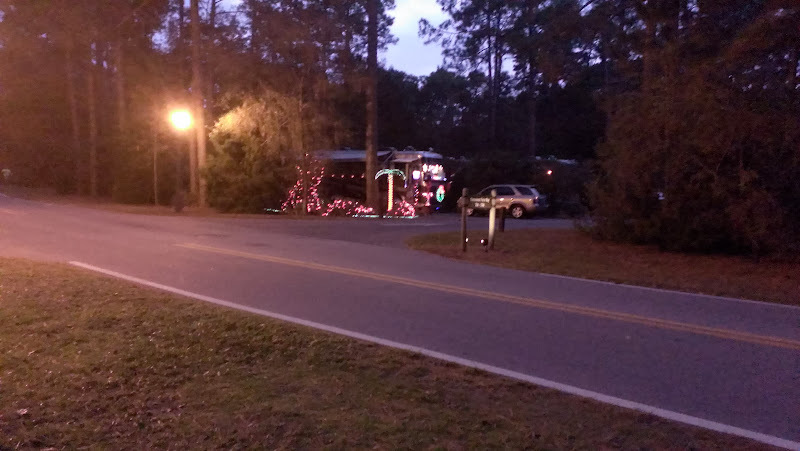 Dad was stringing lights along the edge of the camper and on every tree! 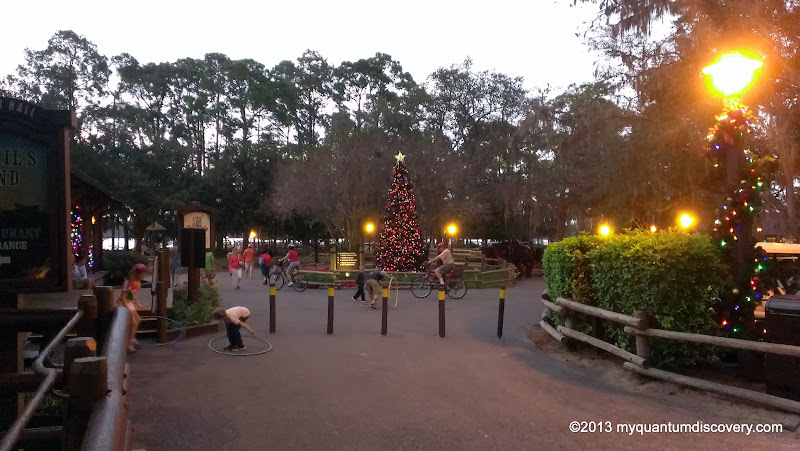 Another teenager was tapping candy canes into the ground and the dog (non-inflatable type) was standing there watching it all wagging his tail. It could have been a Norman Rockwell scene! Not sure what Mom was doing but she was around somewhere. 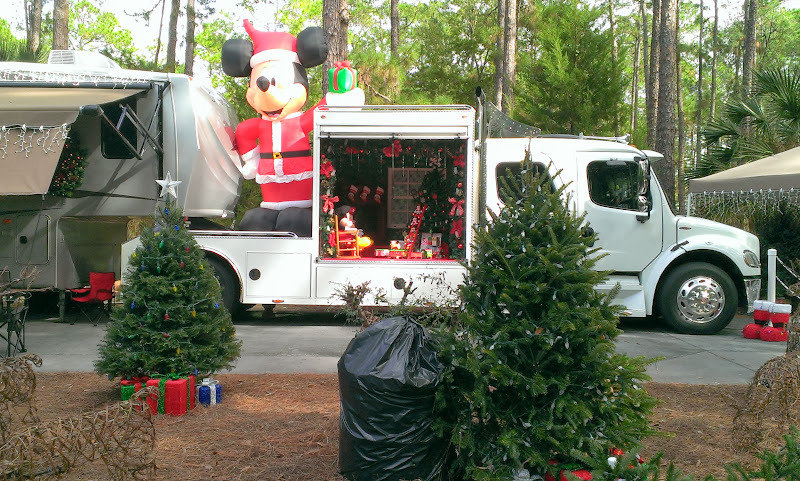 Would every inch of space be occupied with some type of inflatable and Christmas decoration? Yikes where do they keep all this stuff? No room for a vehicle (must have left it at the entrance parking lot). 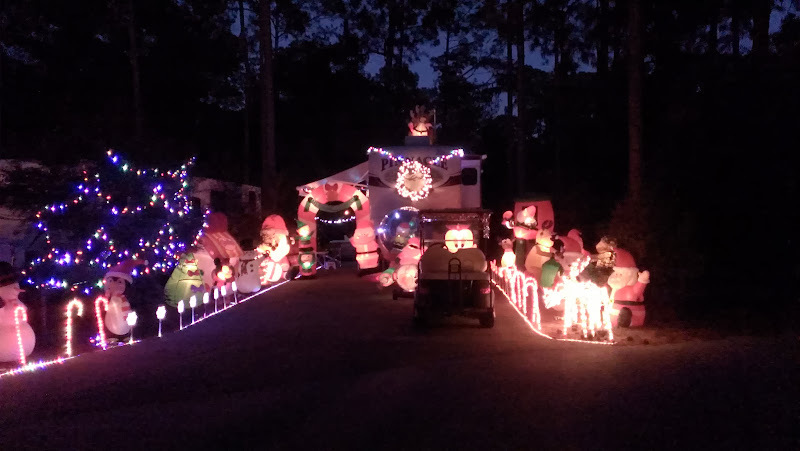 Good thing they have two golf carts – surprised those weren’t decorated, must be rentals! 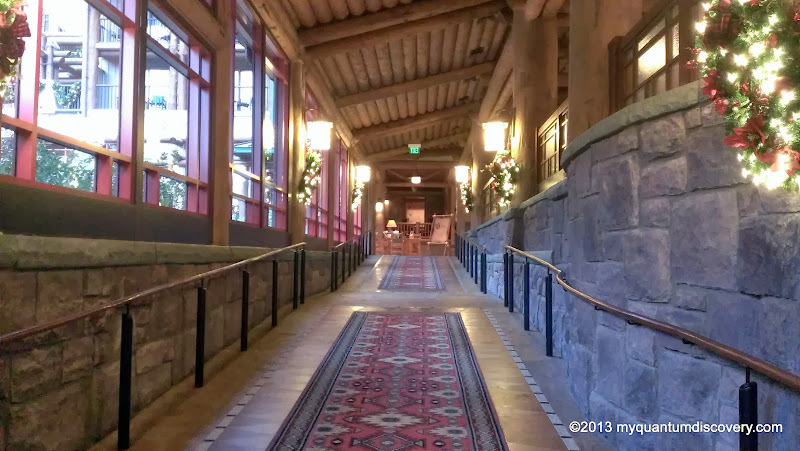 Oh, I almost forgot to mention, there is also a digital display showing how many days are left until Christmas and a motion detector that starts chiming Christmas carols every time someone goes by! Not being particularly fond of inflatables (lots of time they end up turning into deflatables which isn’t attractive at all), I was a little skeptical of how this was going to look but it ended up looking quite nice. 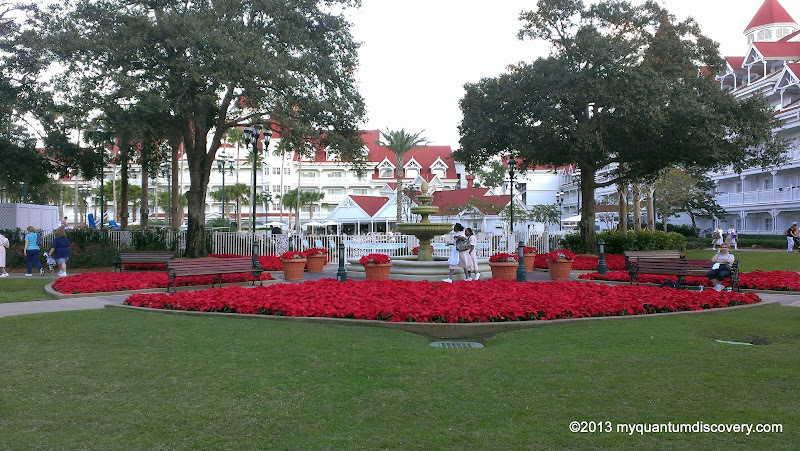 It definitely attracts a lot of attention with people going by and stopping to take pictures. And to think that there were other sites that had even more decorations! Of course, with our new neighbors, we now look like the Ugly Duckling (or is it the Ugly Reindeer) or the local Scrooge of the neighborhood. No lights, no tree, no icicles, no inflatable, no deflatable, nothing Christmasy about us! Not because we’re bah humbugs but because we left it all behind packed away in storage. 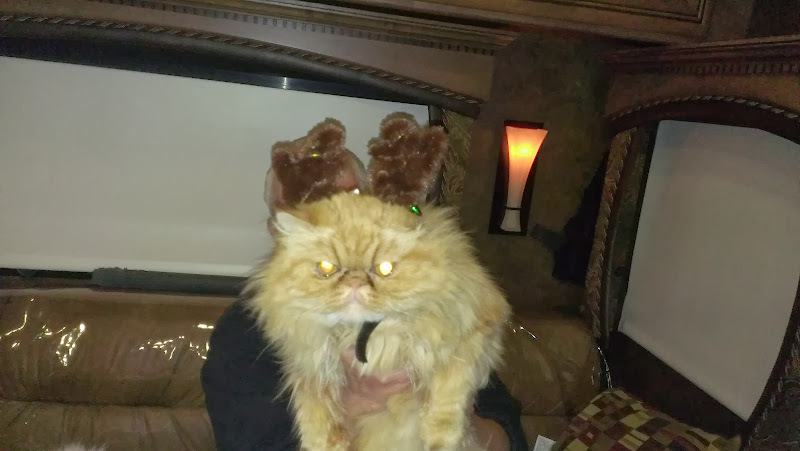 The only thing decorative we have are the free kitty antlers from Petco and we can’t even get a kitty to wear them. Maybe a Santa hat would work. Guess a trip to WalMart before the big day might be in order! Later in the week when we did go to WalMart, I was shocked at the price of these large inflatables – prices ranged from $99 to $199. Yikes that means that some of these people have spent hundreds if not thousands of dollars to decorate their site! And the entire time all of this decorating was going on, my big elf and little elf in the photo on the left were working hard enjoying the show! 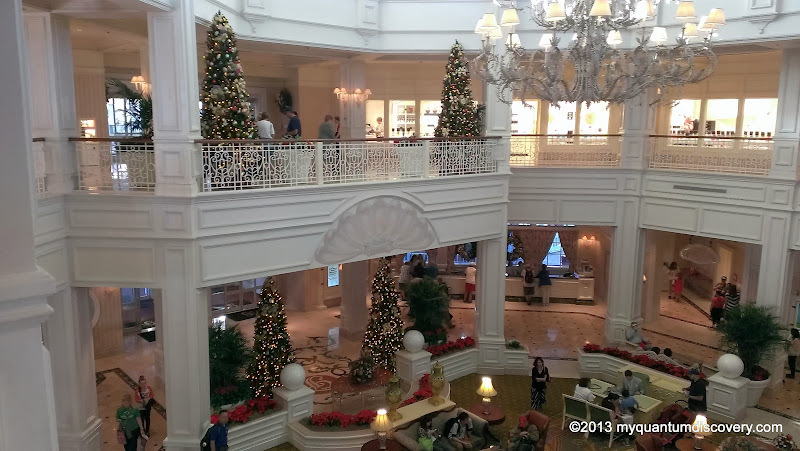 Beyond Ft. Wilderness, the majority of the hotel lobbies at least in the luxury resorts are decorated with gigantic beautiful Christmas trees which we visited on December 1st and 3rd. 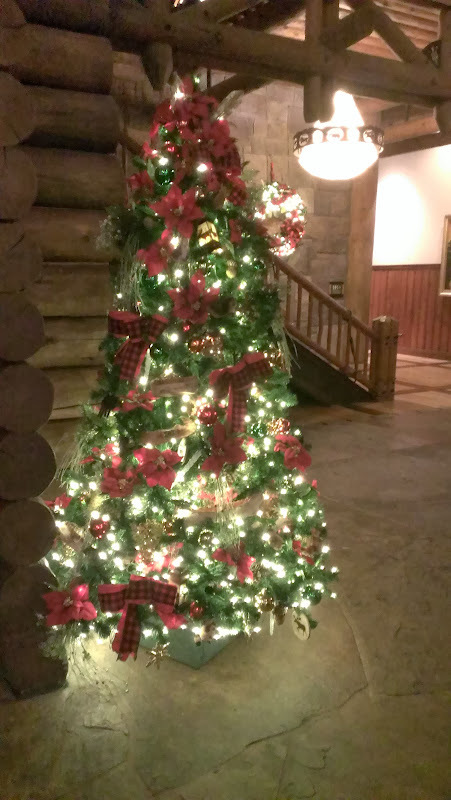 You can’t help but ooohhh and aaahhh over each one, all decorated in a particular theme. 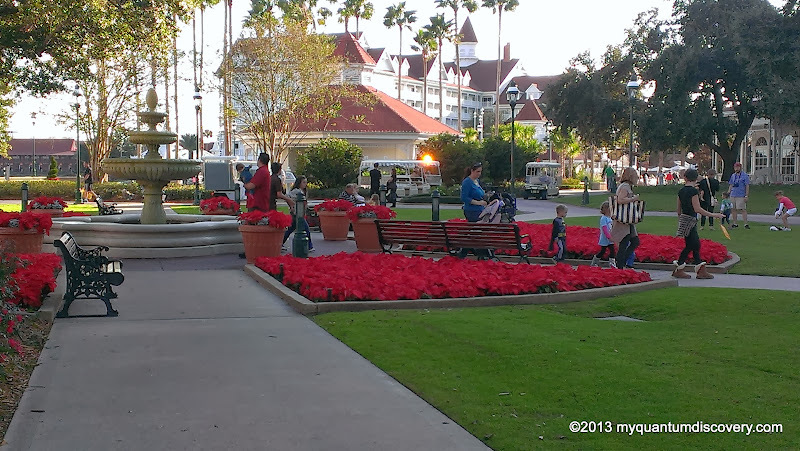 And poinsettias are planted everywhere! 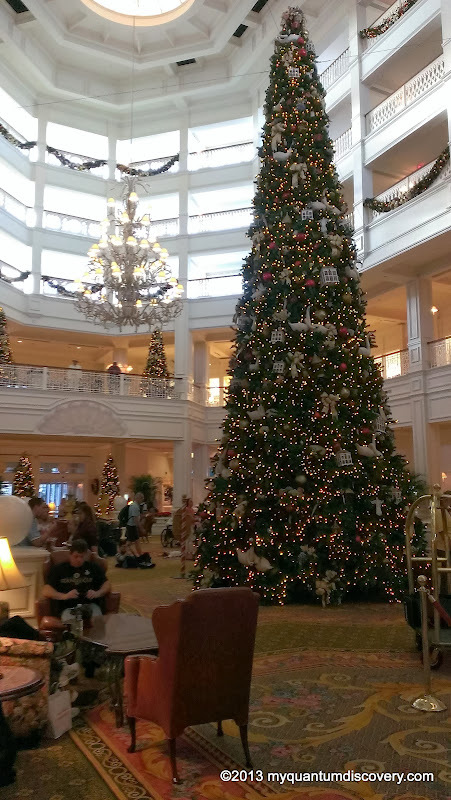 At the Grand Floridian, the majestic 45 foot Victorian tree is our favorite (and similar to the tree in Wilderness lodge). 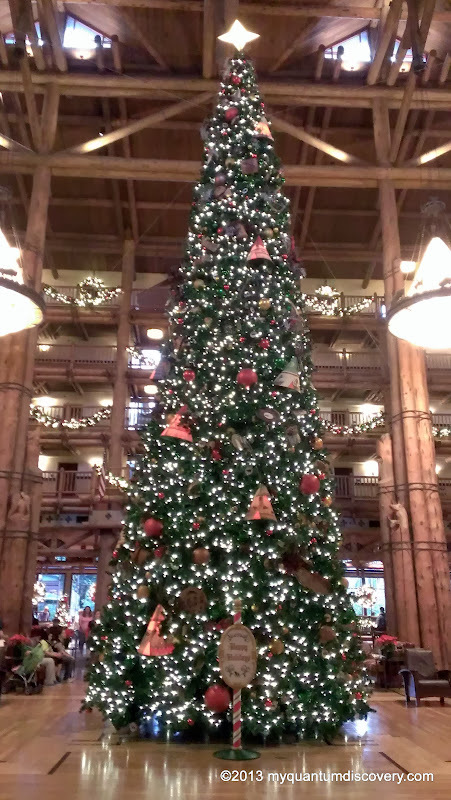 Knowing that we had a hard time finding room to store our measly 7 foot high tree in our house, we wondered where on earth does Disney store all these decorations and how on earth do they put up and decorate a 40 foot gargantuan tree? 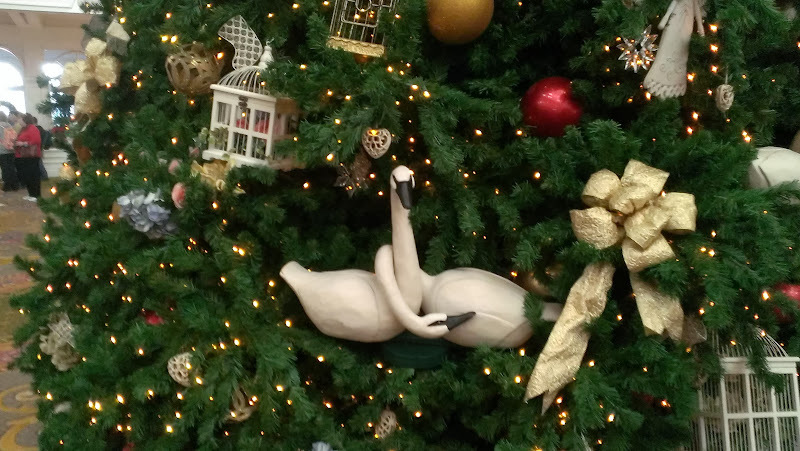 Sure enough, through the wonders of modern technology and social media I found a You Tube time lapse video of the tree being assembled and decorated. 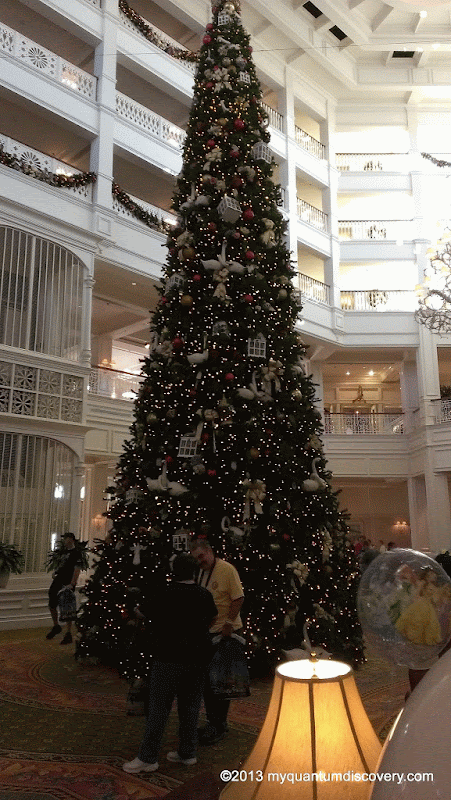 It takes over 6 hours what looks like about 10 workers and a boom lift to put this tree together – and that’s just one of hundreds on the Disney property! 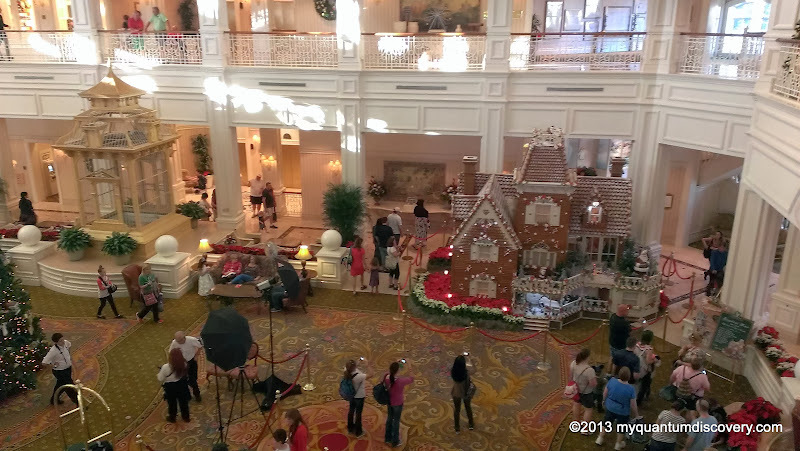 And then of course there’s the 16 foot tall and 18 foot wide Gingerbread House also inside the lobby which is totally unbelievable. 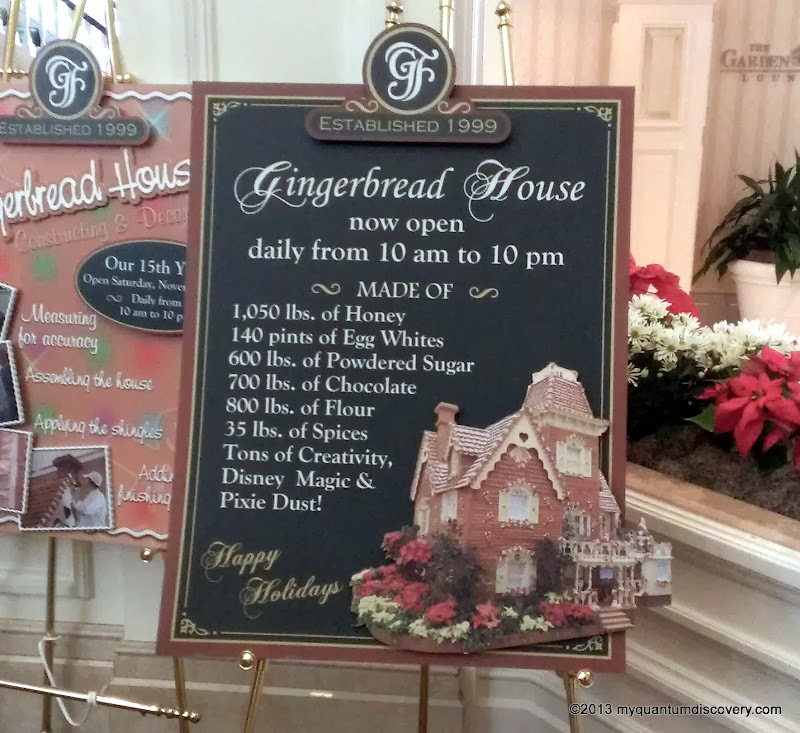 There’s even a shop inside the house where they sell gingerbread goodies! It has a wood frame requiring 60 sheets of plywood, 40 windows and 1,000 board feet of trim. 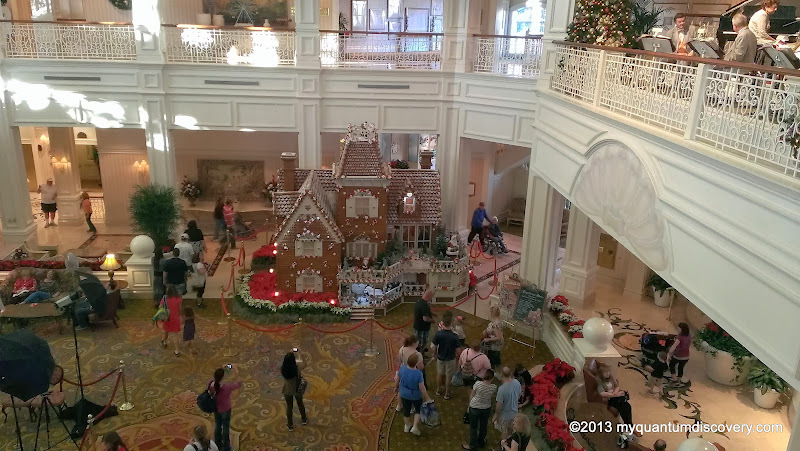 The gingerbread is applied on top of it. 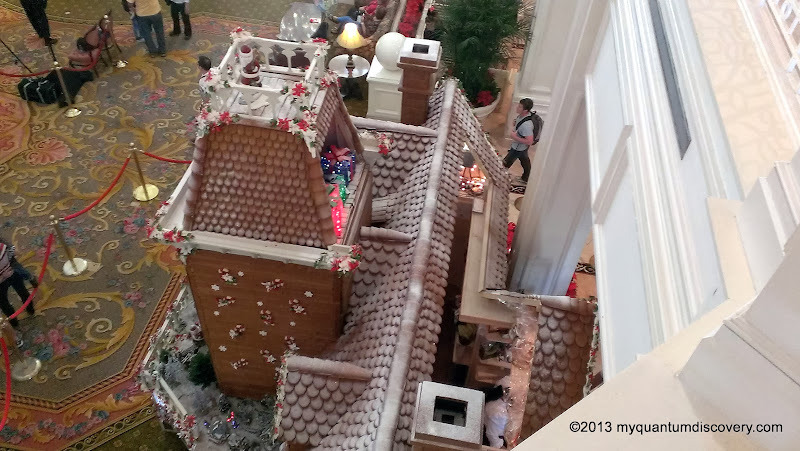 It takes them more than two months and 840 hours of labor to produce, cut and bake the 5,089 “shingles” which decorate the Gingerbread House. 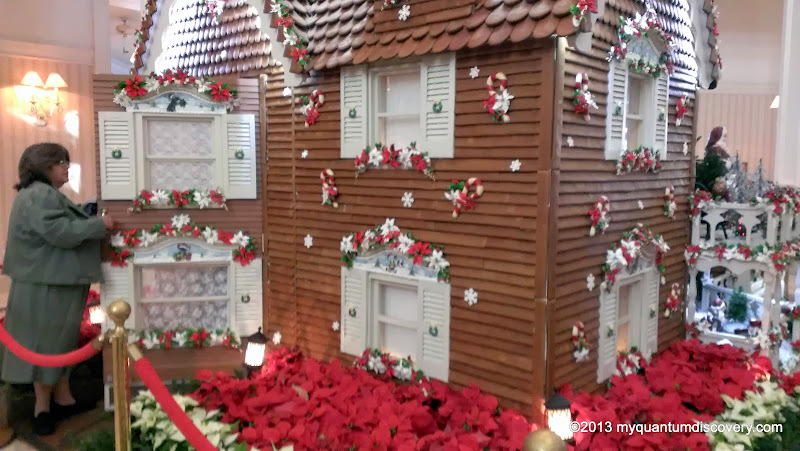 And the house has all sorts of cute decorations on it – these are made out of chocolate. The detail was incredible! 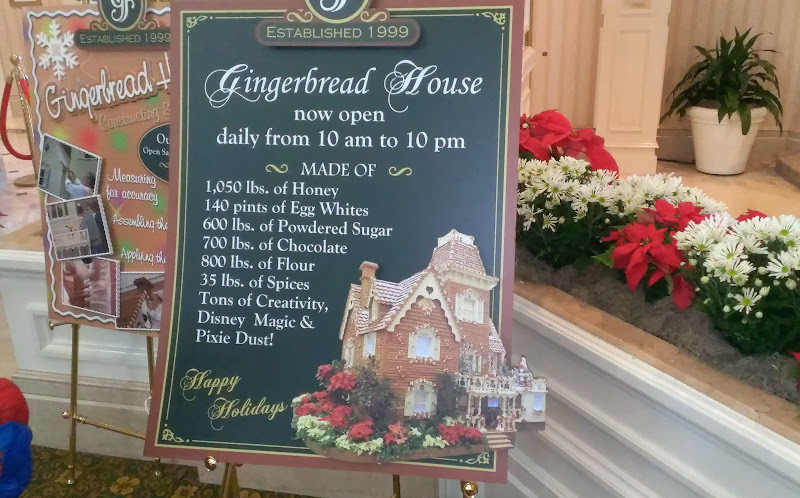 What kind of ingredients are used to create the gingerbread house? Well, there’s 1,050 pounds of honey, 140 pints of egg whites, 600 pounds of powdered sugar, 700 pounds of chocolate, 800 pounds of flour and 35 pounds of spices! Whew, hope they have a big enough bowl to mix all that together! 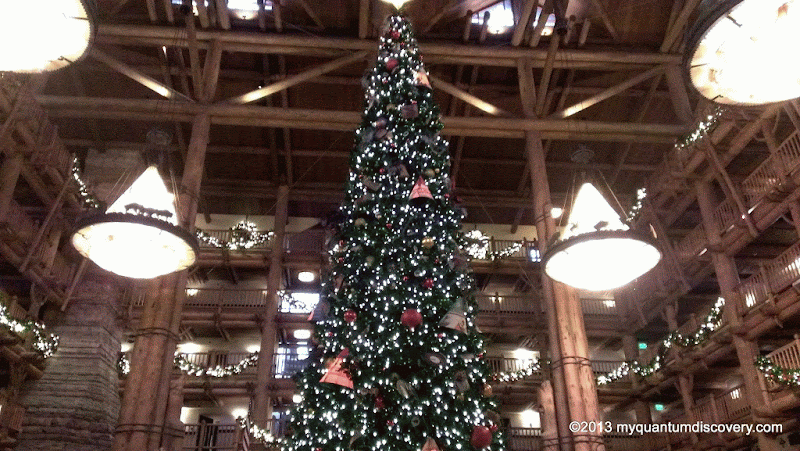 Our second favorite tree is at the Wilderness Lodge which has a beautiful 4 story high Christmas tree, all decked out in a southwest style with small glowing teepees. 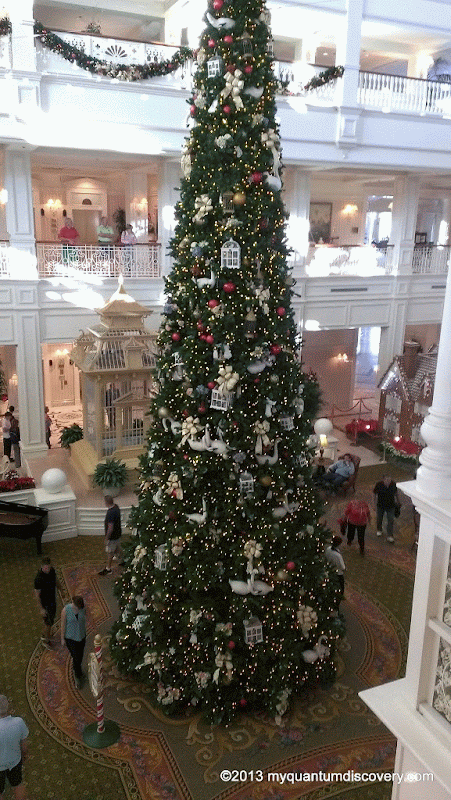 This trees assembly must be similar to the Grand Floridian tree. 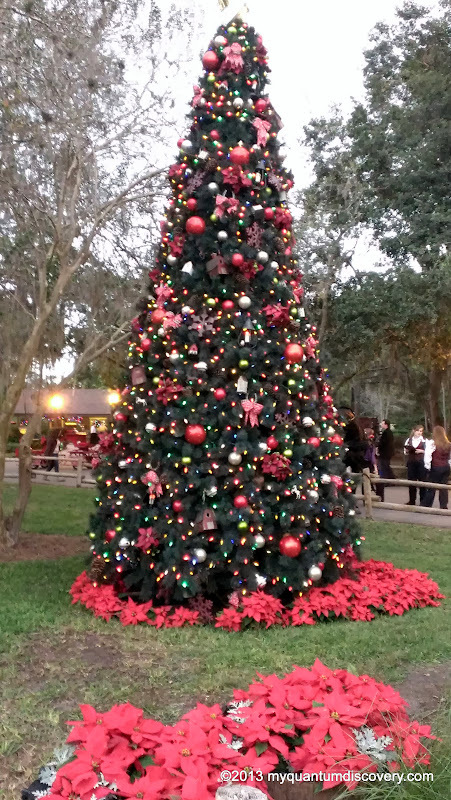 If you are visiting Disney around the holidays, they do have a Disney Holiday D-Lights Tour which is a 5 hour guided tour that explains how they prepare for the holidays but it is $209/person. 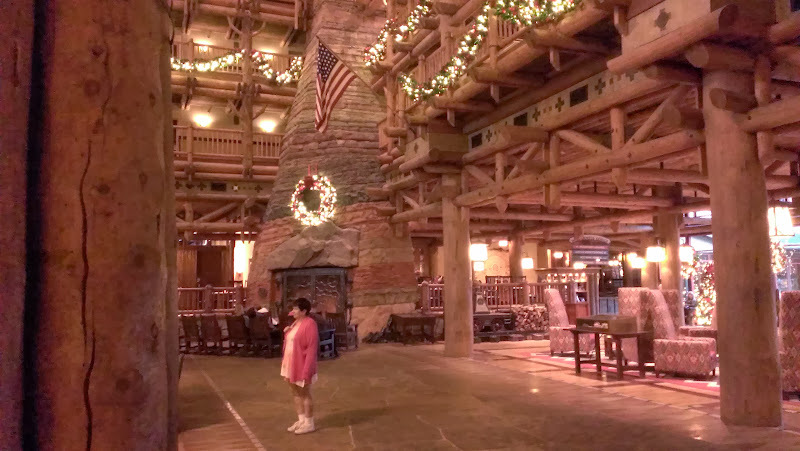 It does explore the decorations and events at 3 of the parks (Candlelight Processional with celebrity narrative, Osborne Spectacular of Dancing Lights at Hollywood Studios and Magic Kingdom) and includes a buffet at the Wilderness Lodge. It sounds expensive but no park tickets are required so that price includes the cost of a 1 day park hopper ticket. 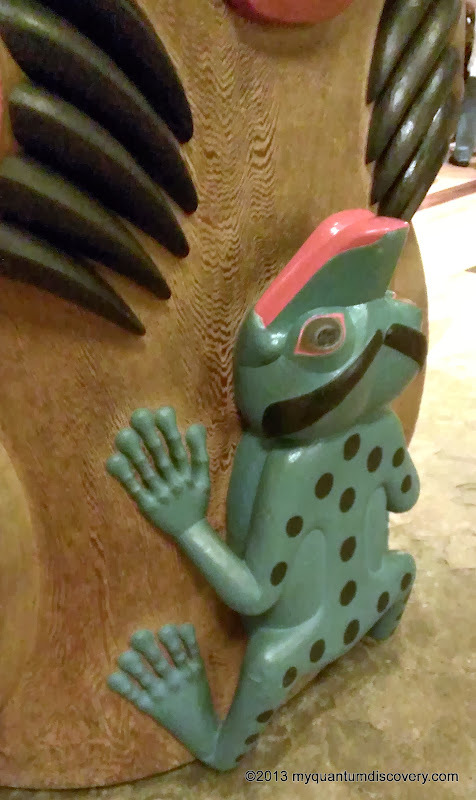 I’m sure it is fascinating as most Disney tours are but the price was a little more than what we wanted to spend. 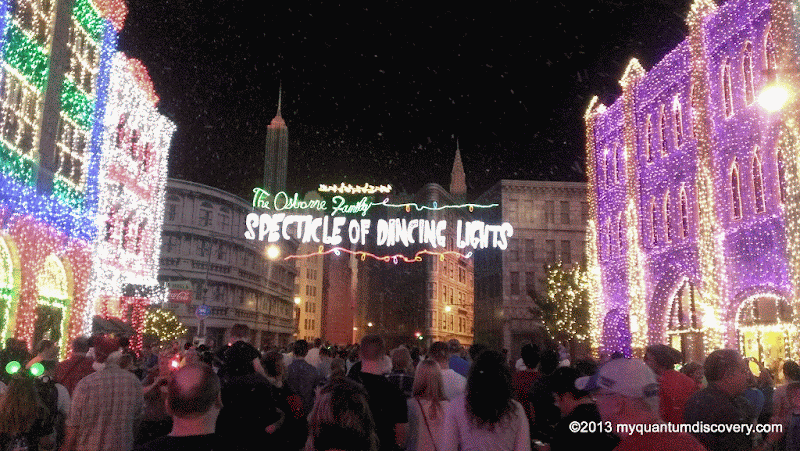 And then of course, the holiday decorations at Disney wouldn’t be complete without mentioning the Osborne Family Spectacle of Dancing Lights. 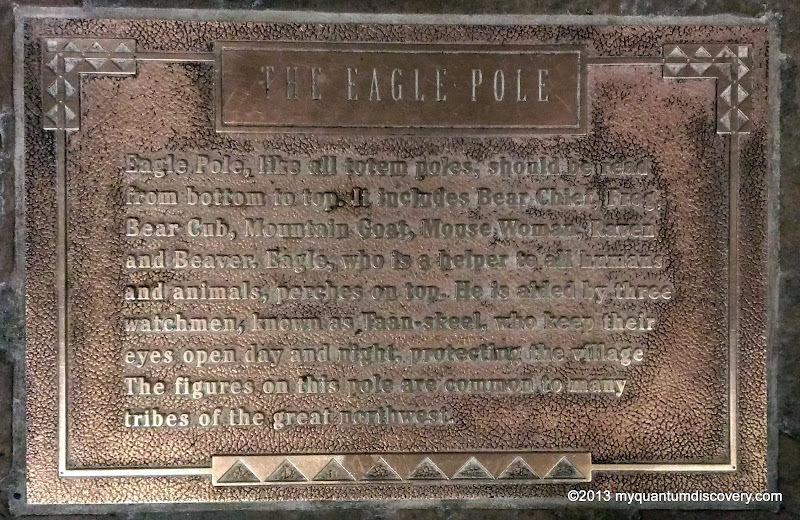 Since we went there one night, we’ll cover that in another post. 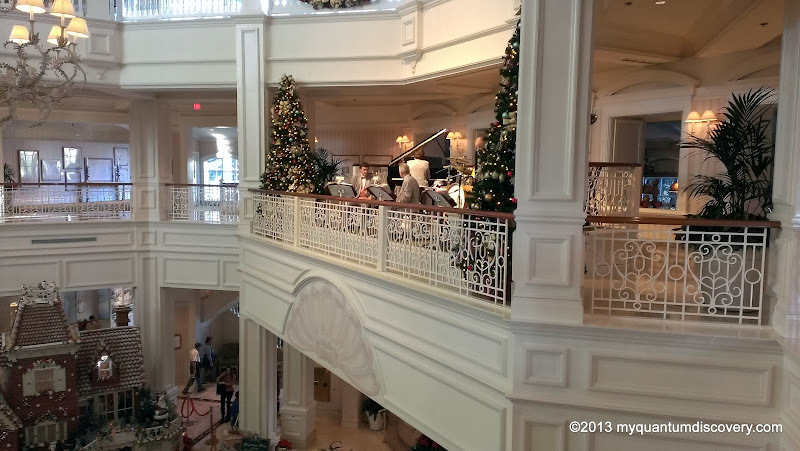 Here’s a time lapse You Tube video from 2012 that shows the transformation from Halloween to Christmas. 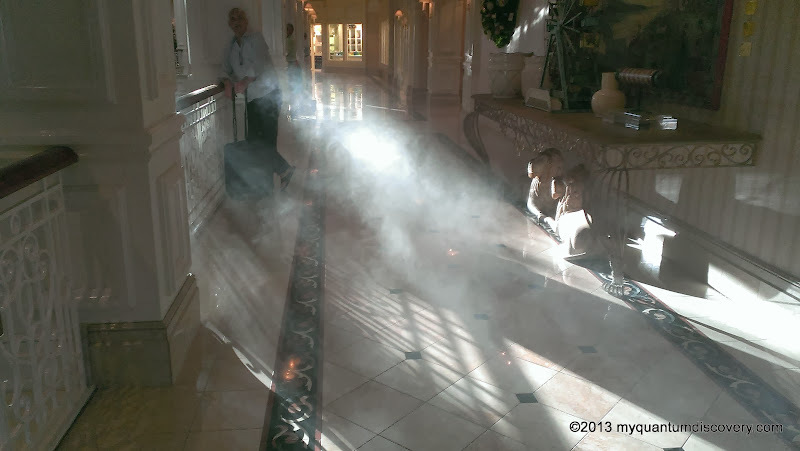 And you think decorating your house is a big deal! 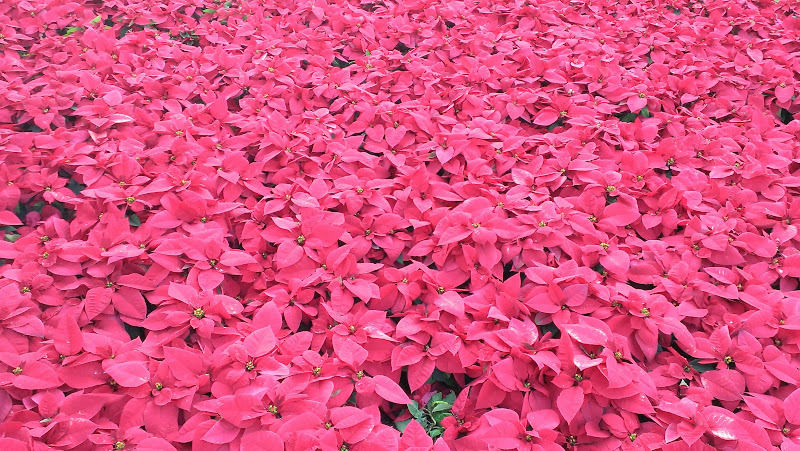 Ah yes, tis the season…..
What lovely pictures. Feeling a little jealous because there is a freezing wind here today and just can’t get warm. 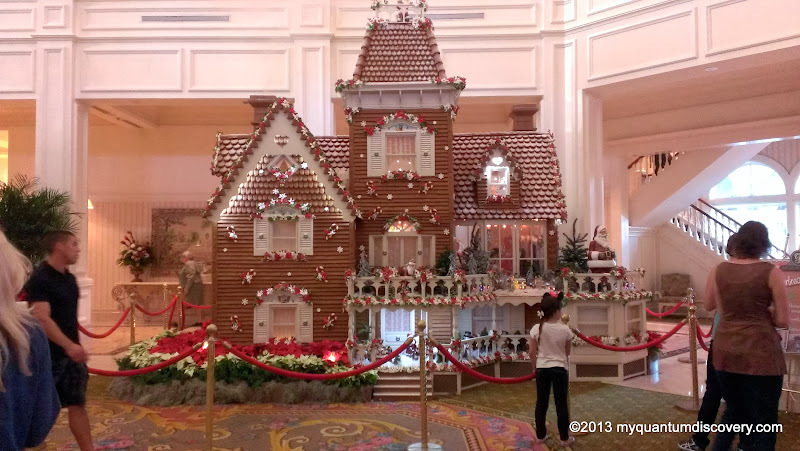 They gingerbread house looks delicious! Were you tempted to bite a big chunk off?? Thanks for the compliment on the pictures. 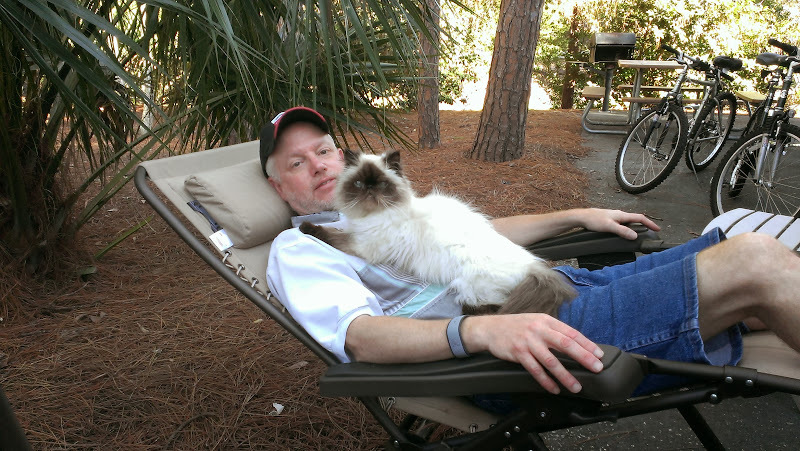 I don’t blame you for being jealous – we would be too if we weren’t here! 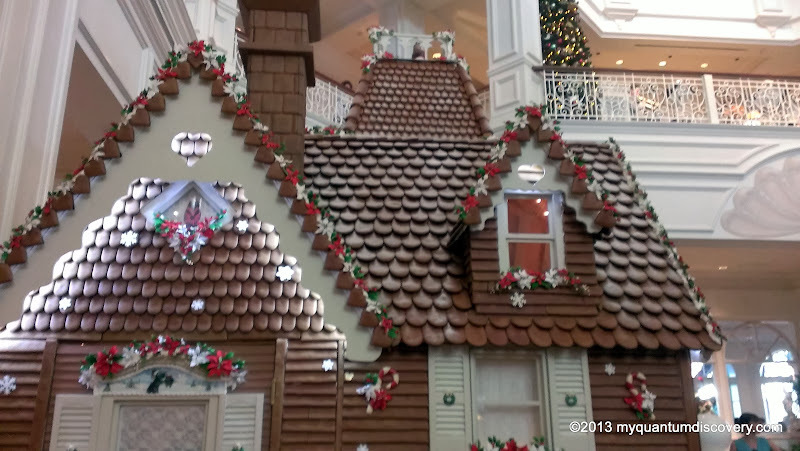 The gingerbread house did look yummy enough to eat but we resisted. Didn’t want to be a headline on the news! Stay warm!